You&#x2019;d love your yard to be blooming with flowers, but just don&#x2019;t have the patience to plant and maintain them. What you may not realize is that you can create petals that will last for ages when you make a flower from sheet metal. Sheet metal flowers are more versatile than the real thing, as they can be placed or nailed anywhere, even areas real flowers would fear to tread. They can also be made in an array of crazy colors or adorned with swirly lines, polka dots and pouty faces. 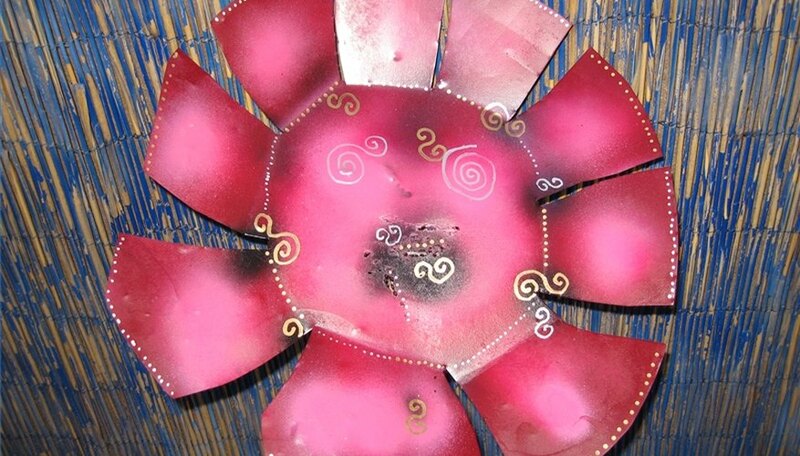 You can make a flower from sheet metal with a few simple tools and a few simple steps. Cut the base. Get a piece of sheet metal from your favorite home store or salvage yard. Use your snips to cut it into a square. Cut the edges off the square to create a circle. Create the petals. Mark a circle in the center of your circle which will act as the flower&#x2019;s center. Each petal will not go any deeper than the center circle. Begin to snip thin triangular pieces where you want each petal to begin and end. You may want to draw the petal lines with a marker first. Bend the petals. Once your petals are finely snipped out, bend the petals slightly upwards. You want the crease to be right at the edge of the circle you drew for the flower&#x2019;s center. You also want the petals to stay straight, with the sole bend being where it connects to the middle. Bend the petals at a 45-degree angle or less, or it may look like your flower is drying up and dying. Paint it. Pick as many colors as you wish to adorn the flower. Pick one as the base, which you will paint first on the back of the flower, just so its back isn&#x2019;t some hideous sheet metal color. Flip the flower over and paint the front. Add any details. Once your paint is thoroughly dry, use paint markers to add dabbles, swirls, those pouty faces, stars, dots around the edges or whatever else you want your flower to flower with. If you are going to nail your flowers somewhere, use a dab of paint marker on the nail once it&#x2019;s hung to blend it in. Sheet metal edges are sharp. Wear a thick pair of gloves or be ultra-careful. Don&#x2019;t place the flowers where they may cut pets or small children who are wont to brush against them.